The Trump administration was always going to be bad for climate change scientists and those who believe in a greener, more sustainable world. The change from informed acceptance and engagement to unhealthy scepticism happened pretty quickly once Donald J Trump was inaugurated in January, culminating in the US announcing it was stepping back from the Paris Climate Change Agreement during the summer. While expected, Trump’s speech on the Whitehouse lawn that day in June was undoubtedly a gut punch to every scientist who has worked hard to gather evidence on climate change over the last four decades or so. By October, things hadn’t got any better. The New York Post reported on protests after the EPA essentially prevented pro climate change scientists from presenting their data at high profile conference in Rhode Island. Now help has arrived from an unlikely source. 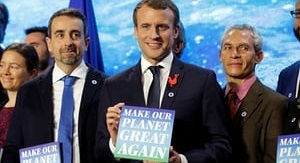 Following Trump’s speech about leaving the climate change agreement, French president, Emmanuel Macron had made a public announcement that the US decision wouldn’t derail the real efforts being made by practically every other country on the planet. The climate change agenda would continue and had to succeed. Shortly before Christmas, Macron awarded 18 scientists from around the world millions in grants to relocate to France and continue their important work. The project is a move by the French government to attract the best researchers and scientists in climate change to the country – there were over 5,000 expressions of interest and of the 18 grants, 13 were given to Americans. One of the winners, Camille Parmesan, will be moving from the University of Texas to the Pyrenees to explore how man-made climate change is impacting on local wildlife. The grant awards have come as a welcome fillip to climate change scientists in the US, but closer to home there has been some worry that Macron is giving money away that could be better spent at on French scientists and their projects. While the situation is not ideal in the US because of the Trump agenda, many believe it doesn’t actually matter. Both businesses, including many large corporations like Google and Apple, high profile individuals and indeed many states and cities are still committed to the climate change agenda and will continue to forge forward despite what the government says or does. Nothing exemplified the strange times we are living in more than President Macron teaming up, albeit briefly, with Hollywood legend Arnold Schwarzeneggar to tell the world they were going to ‘make the planet great again’. This is a battle that many believe we cannot afford to lose – the good news is that they are still in the majority.